I’m not ill very often, but with my recent bout of flu knocking me for six, going fishing was the last thing on my mind. But as I hit the second week of illness, although I was far from anywhere near normal, my thoughts began to drift into piscatorial regions. A sudden change in wind direction saw the general air temperature raise quite dramatically. From overnight lows of minus double-figures the daytime readings were a little more seasonal at 6 and 7C. And that meant all the local stillwaters, which had previously been frozen solid, were now ice-free. As an all-rounder I obviously keep an eye on conditions, so I can target species more effectively, but always at the fore-front of my thinking is ‘What do I fancy fishing for?’ And with a definite leaning towards pike I set the alarm nice and early and arrived lake-side for first light. I chose a peg (I had the venue to myself) that I have fished before and had a lot of water to cast to, with depths up to 4 metres. With the water temperature at 4.3C, although it was on the rise, I wasn’t expecting a great flurry of activity from prowling pike. I was looking more at lots of regular casting and seeking them out rather than the other way round. Well, within the first 20 minutes I had 2 runs but neither materialised. Both were on small sardines so not exactly a mouthful even for a small pike. I was confident though and as the morning edged into afternoon another run developed. This time I netted the fish. Only a small one but it avoided a blank. The hooks came out easily with the forceps and the only damage was to the fish’s pride. Typical pike, it lay motionless in the margins sulking for a while before a flick of its tail saw it power off into the deeps. I took a photo of it prior to that and although the branches aided it, you can see just how camouflaged the pike is in its natural environment. Always in tune with the natural world around me, I saw and heard regular ravens and also my first siskin of the winter. A flock of c20 finches briefly landed on a common alder to feed. There may have been redpoll in with them, I don’t know as my view was not only brief but also limited. With just a morning to spare, my second pike session of the week saw me on the local canal at first light. With daylight breaking through my first bit of excitement was a woodcock in flight – my first of the year. On the fishing front my tactics were the same as session one – float-fished deadbaits with sardine on one rod and a bleak on the other. The water temperature reading was 4.6C so still quite low as the venue recovered from its recent ice-over, but nevertheless taking steps in the right direction. But I’m a great believer in the obvious principle that you can’t catch unless you have a bait in the water! And a couple of hours after casting out the bleak-float started to tremble. Is there anything more exciting than watching a stationary pike float in the water? Well only when it comes alive! Aware that the fish would be fairly sluggish due to the water temperature I timed the strike with great care. Too soon you pull out but wait too long and you have a deep-hooked fish. The majority of canal stretches I fish for pike are what I would class in the ‘challenge’ bracket. I never see other predator anglers and although the pike are obviously there, they’re not present in great numbers. The vast majority of times I only catch one fish and when I do, regardless of size, it’s always a result. The areas I fish I located purely and simply by doing the legwork. And by putting in hours of fishing time. Sometimes they resulted in fish but for many sessions there may well have been no pike in the swim. And that’s just one reason why, if you’ve been putting the effort in, you don’t have to feel any pressure whatsoever to reveal locations. Any pike about? Only one way to find out! I don’t want to appear critical, because I’m not, but you can’t expect someone to do all the hard work and then just latch onto their successes. And in these days of the internet, information is being sought after by many. And there’s nothing wrong with general knowledge gathering. But for many it isn’t that, it’s just simply ‘Where did you catch it?’ or ‘Tell me the swims you fish’. My single pike from the canal inspired me and with one slot to go to round the week off, that’s where I headed. The very next day in fact. And although in itself it’s not a guarantee that you’ll catch, seeing the water temperature up to 5.5C was certainly an encouragement. It was a very wet and windy start to the day as I cast out a bleak and a sardine and waited. Just an hour into the session the bleak float came alive and started to move across the canal. It was just a small fish and put up no fight at all. I was glad of that as the hooks came out in the net and so with a little head-shaking it may have shed them in the water instead. The fish itself was in top condition. Pike thrive on neglect. 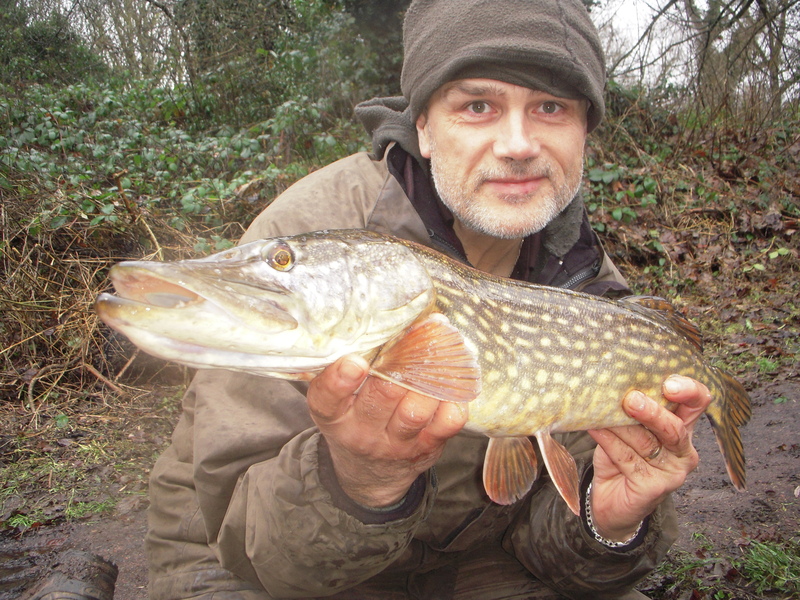 To catch one pike from my canal haunts is good but to get two is excellent. And so I rounded the session – and the week – off on a high note as the sardine tempted another fish. I could see in the clear water as I brought the pike in that the hooks weren’t deep. With the bait fish showing on the outside I was grateful to net another pristine condition pike. The photo above is the same fish but on the mat prior to release. I know some, particularly lure anglers, release their fish in the water and that’s fine but if you intend to get the pike on the bank for a photo or to weigh it, then an unhooking mat is essential. And finally, one of my recent predator-related tackle purchases has been a rig tube. For years I’ve been using a Fox trace wallet and I’ve been more than happy with it. But with the zip gone and general wear and tear taking its toll I decided to replace it.